It is often claimed that physics and God are attempts at explaining the same thing. That thing is the universe. The four big questions of existence are: “Why are the laws of nature what they are? Why does the universe consist of the things it does? How did those things arise? How did the universe achieve its organization?” Physics and God are both used as methods to answer these four questions. In my previous post I touched on the issue of pre-Christian beliefs and made the point that Pagans were very disposed to truth seeking. The Ancient Greeks left behind a massive volume of literature which is still relevant today. 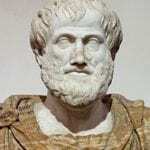 The two most notable writers of the period Aristotle and Plato are essential reading for anybody who seeks to probe the ultimate questions. Yet with the coming of Christianity they were cast aside and ignored. Though modern science sprouted out of Christian Europe, we could mount an argument that it was due to the legacy of the Greeks and despite Christian philosophy that enlightenment came. Christianity waged war against the Paganism it replaced, and it dragged its feet (and still does) against the scientific thinking that has all but replaced Christianity. Pagan philosophy and science both seek to discover the truth in a way that Christianity does not.